Accounting is often not the forte of the small business owner and can be tedious and time consuming. Nowadays, much of the bookkeeping, accounting, and invoicing that comes with being a business owner can be automated to save time and money. Last month, Knowlton Thomas published a share-worthy article on Tech Vibes on the behalf of Telus. The article was titled 'How to Streamline Your Accounting and Invoicing with Modern Software Solutions' and describes 7 great software solutions that are out there for accounting and invoicing, several of which were developed here in Canada. "Accounting has never been an entrepreneur's favourite aspect of running a business; fiddling with all those numbers just doesn't feel big-picture enough to for a visionary to dwell on. But efficient accounting is crucial. Fortunately, many new cloud-based options exist to make accounting less painful than ever before. According to Ryan Lazanis of Xen Accounting, cloud-based systems will save you time when it comes to your accounting. They are smarter, easier, and more innovative than your traditional desktop accounting systems. "No matter how early on you are in your startup, you absolutely need to implement an accounting system," says Ryan Lazanis of Xen Accounting. "Without a proper system in place, getting an accurate picture of how your startup is performing is near impossible. WIthout an accurate picture of the numbers side of your business, it’s hard to know where and when to pivot (if necessary), what adjustments need to be made to overspending, how to follow up on your receivables or payables and just overall, you are navigating your business blind." Below are a few of our recommended cloud accounting systems and invociing solutions for tech startups in Canada. Vancouver-based Kashoo is the first cloud accounting system I ever used. If there is one word that could be used to describe Kashoo, it would be “simple." Kashoo is great for those that may not need the many reporting features or 100’s of app integrations in Xero. I’d also say the learning curve is slightly lower on Kashoo as there are less bells and whistles. You can easily enter all your income and expenses directly through the Kashoo dashboard without having to click around anywhere else, which can be a real time saver for some of you. Probably the number one reason to use Kashoo over any other cloud accounting system out there is their iPad app. It has consistently ranked as one of the top accounting apps in the Apple App Store for quite some time now. Their focus is really on the mobile entrepreneur who has their iPad with them at all times. Kashoo can also connect to your bank to pull in your transactions as well and they use a pretty nice bank reconciliation tool to boot. I wouldn’t say it’s as sophisticated as Xero’s, but after Xero, it’s better than any other I’ve ever used. Wave, from Toronto, is a cloud accounting system that is completely free; yes, I said it, free! When I’m at some tech meetups and I’m explaining my business, a popular question I tend to get is, “So are you like Wave?” This goes to show how popular Wave really is. A Canadian business from Toronto. If you are a consultant, freelancer or a service-based small business and you invoice your clients according to time, then Freshbooks is probably for you. None of the other options above give you as robust of an invoicing solution as Freshbooks. It is dead simple to use and you can be creating invoices in a flash with little to no training. The real goal is Freshbooks is to make the system as simple as possible. One of their main selling features is that it has an excellent time tracking feature. There are various ways for you to record time. You can start a counter or you can log the hours manually according to day, week or month. Freshbooks also supports project based invoicing. So if you have a large project, you can assign several employees or subcontractors to the project, track their hours and rates, track the costs associated with the project and then send out invoices based on that. Invoices can be created in a matter of seconds and the invoice templates provided look great as well. Quoting is also doable in Freshbooks and they are easily converted into an invoice upon acceptance. 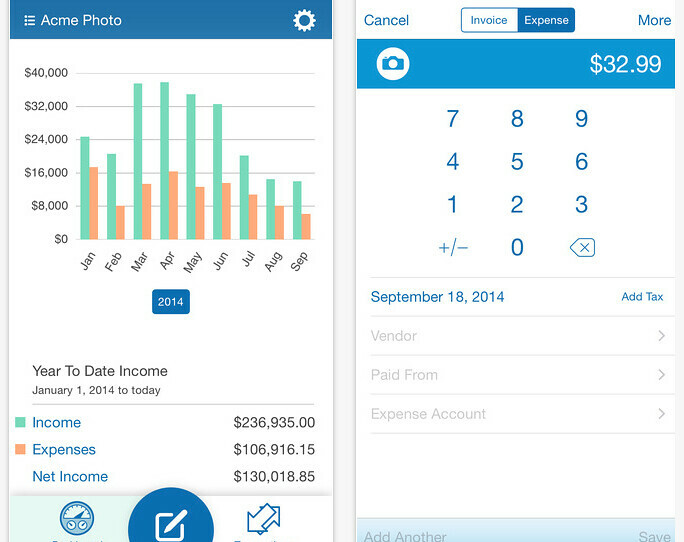 Expense tracking is another feature that is featured in Freshbooks. We tend to recommend this to businesses that are not incorporated and handle all of their revenue & expense tracking within Freshbooks itself. For incorporated businesses, we typically recommend an integration with one of the cloud accounting systems mentioned further down in the article. Recognized as the one of the top accounting software solutions for small businesses, Sage offers one of the industry’s most flexible and cost-effective solutions to accept payments and is recommended by top accountants and bookkeepers. Sage offers simple solutions for businesses, whether you want your data on-site or in the cloud. More than 6 million customers worldwide trust their 30-plus years of experience. Sage's business management software helps you manage accounting, customers, inventory, services, jobs and employees—all in one centralized system. Sage also allows businesses to accept payments on mobile device with no limit on monthly credit card transaction volume and with encryption at all stages of the transaction. The company's breadth is vast, handling everything from accounting, HR, and payroll to payments, enterprise resource planning, and customer relationship management. Xero keeps things simple. You may not get every feature under the sun, but you get the features that you need. And the best part? They have a developer friendly API that allows for third party developers to integrate their apps into Xero. So if you wanted a more robust invoicing system with time tracking, you could integrate this with Xero. If you wanted a CRM, you can integrate this with Xero. Doing your own payroll? Yup, there are integrations for that too. There are hundreds of different apps that you can integrate with Xero to avoid manually entering information into 2 different systems. If you’re a developer and none of the available apps suit your needs, you could literally develop your own! It also learns on the go. So if, for example, on a monthly basis you have the same exact $54.50 bank fee, Xero will “learn” what you did the month before and automatically assign this transaction to bank fees going forward. You can also create bank rules whereby you tell Xero that whenever you see a specific vendor or dollar amount appear on the bank statement, to automatically assign that transaction to a particular account. This can save you tons of time. Intuit has made strides over the past year with their cloud product and as a result your invoicing needs can be met better than ever with Quickbooks Online. By connecting to Paypal or Stripe, they make collecting payments from your customers simple. A quoting module also helps you send out estimates to clients that can then be easily turned into invoices, streamlining processes further. In the past year, Quickbooks Online has been able to add a host of third-party apps to their roster to help out with automation. By being able to connect apps like Quote Roller, you can supercharge proposals and increase sales conversions. Quickbooks Online is a worthy choice. Harvest is a popular app when it comes to invoicing and in some respects there are quite a few similarities to Freshbooks. If there is a particular feature that isn't found in Freshbooks that you're looking for, you might want to check out Harvest. Harvest is an app that should take careful consideration for your invoicing needs."